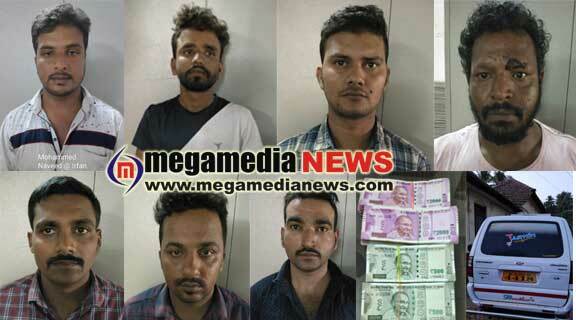 Mangaluru : Seven people have been arrested on Thursday for allegedly robbing a fish trader of Rs 5 lakh at the railway station here, police said Friday. The accused are Mohammed Sabir, 31, Mohammed Naveed, 29, Khwaja Saab, 28, Mohammed Nabil Saab, 31, Sayyad Hussain, 32, Sayyad Fayaz, 31, and Nasir Sheikh, 21. The victim Mohammed Nakwa from Ratnagiri, Maharashtra, was relieved of the money when he arrived at the station February 5, the police said. The accused snatched the bag with the money he was carrying and fled, they said. A case was registered and investigations led the police team to Bhatkal in Uttara Kannada district, where all the accused were apprehended, they said. A car and mobile phones were also seized from the gang, they added.